Always start your travels with a full tank of gas, making sure your vehicle is in top working condition, and check that you have a good spare tire. Know where local, city and state police stations are located on your route. Keep an emergency kit in your car and make sure, at the minimum, it contains an emergency flashlight that does not require batteries, a reflector, jumper cables, tie down cords, a poncho, first aid kit, multi-purpose tool, emergency blanket, compass and water. Also, make sure that you have an emergency escape hammer in your car that is within reach of the driver's seat. Tens of thousands of people are trapped in their vehicles every year from collisions or from being submerged in water. A seat belt can easily become jammed during an accident and you will be unable to release it in the normal way or your door may be jammed shut with your airbag pressed so tightly up agains you that you are momentarily unable to move. Now, imagine that your fuel tank has ruptured and your car is on fire or about to burst into flames. This is a scenario that is played out thousands of times a year. An escape tool can save your life if either of the above scenarios. You need to be able to get to it quickly, which is why you should plat it within easy reach. A good escape tool can cut a seat belt, deflate an airbag, and bust out the side window. Park in well lit areas with moderate pedestrian traffic and always remember where you parked. When possible, back your car into parking spaces because it is quicker if you have to get away. Always lock your car after entering it and leaving it. Never leave keys in the ignition, even for a momentary errand. Carry a spare set of keys. Carry a pepper spray device that attaches to your key chain. If you break down or have trouble with your car, pull off the road, if possible, activate your emergency flashers, and immediately call for help with your cell phone. Remain in the car with its windows up and doors locked until you are absolutely positive that it is safe to exit the vehicle, in which case you would leave your hood up and place an emergency reflector ten to fifteen feet behind your car and get back in it until help arrives. 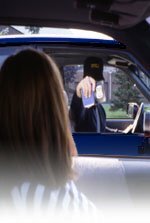 If you are being harrassed by anyone in another vehicle or you feel you are being followed, use your cell phone to reprot the incident, and drive to the nearest populated service station, strip mall or police station, and honk your horn for help. Never pick up hitchhikers or give strangers a ride. You can become a victim of a carjacking nearly anywhere. Carjackers, however, are more likely to attack a motorist at common stopping points such as stop signs, traffic lights, parking lots, gas stations, rest areas, restaurants, and fast food drive-thrus. Most carjackings take place on weekends between 7 and 12 pm. One of the best defenses against a carjacking is to keep your windows up and doors locked. After getting into your car, lock the doors immediately. Should someone attempt to order you out of your vehicle, put it in gear and drive away as fast as possible. Should someone attempt to carjack your vehicle while you are getting in or out of it, throw your keys in one direction and run in the other direction. Just like money or valuables, if they come after you instead of the car, then you will know it was you they were really after to start with and you need to do whatever it takes to not be taken hostage. Should someone attempt to get into your car while you are in it and you cannot speed away, throw your keys out of the car, or in the back seat and climb out the opposite side they are trying to get in. Then, run like lighting while screaming at the top of your lungs. When leaving any area, make sure you are not being followed. Car bump lures and home invasions are one of the fastest growing crimes in this country and most involve being followed home from a shopping center after being targeted for your valuables or looks.